Thora "Myshka" James leaves her life behind to follow her dreams. 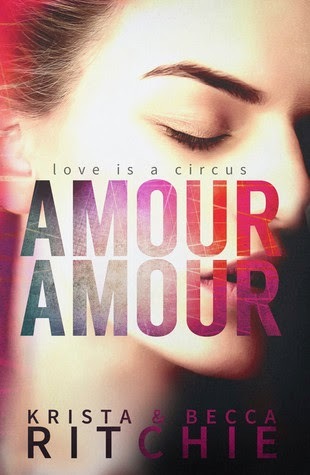 She leaves her college, friends, family, and scholarship behind to audition for a part on Amour, a show a la Cirque du Soleil in Las Vegas. Thora wants to be an aerialist and this is her chance. The night before her audition she meets the "God of Russia"Nikolai Kotova, the leading performer of the show. Their interaction is dynamic and Thora will never forget it (to say the least). To her surprise the next morning he's part of the panel of judges. When she fails to grab a spot she has to face hard decisions. Thora is not a quitter and she decides to stay in Sin City until she can audition again. To her surprise Nikolai offers to train her. This complicates both their lives and in a place were the mentality is always pick the circus first, their relationship is doomed even before it begins. The authors clearly build the relationship between the main characters in a very well delineated thread. There is no insta-love or cheating which was a major plus. Nikolai can be arrogant but he also demonstrates great love for his family, responsibility towards his job and siblings. He supports Thora and helps her when she needs it the most. Thora took a huge chance by leaving everything safe in her life to follow her dreams. I can respect that. It takes major guts to do what she did. I was pleased with the growth of her character and where the story moved to. The secondary characters were great and it wouldn't surprise me if we get more books from a couple of them. “We’re not going to fit together,” I say aloud. He cups my face to look at me. By his strong, unshaven jaw, I’m deeply aware of his age again. “Physically or metaphorically?” he asks with raised brows. My lips part, slightly wishing I kept my thoughts to myself. Two loves. Two passions. At perfect balance.